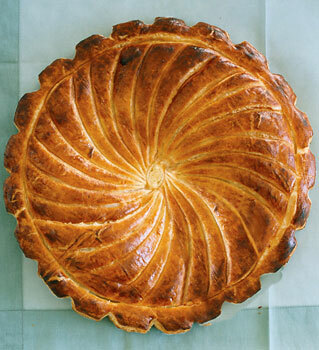 ‘Tis the day for le galette des rois! In France, this King’s cake is made for the Epiphany celebrations beginning January 6 (though celebrations occur throughout the month) and a special tradition is associated with it. Hidden inside the cake is a small féve–either a fava or other dried bean, or a small porcelain trinket. A child closes his eyes or hides under the table while the galette is being sliced, and blindly assigns to whom each piece goes. Whomever gets the feve gets to be king for the day, and wears the paper crown which is usually presented on top of the cake when serving. The only time I had this cake, one year ago, a friend who is a pasty chef himself, brought one to a dinner party from his favourite French bakery. On his days off, he sometimes buys his sweets but of course, he is choosey and said he would only have bought it from this particular place. I had no frame of reference for the galette des rois then but I thought it might have been the best cake of any kind I’d ever had. I have been thinking about it ever since! I was going to buy a galette des rois today but since it is my aunt’s birthday this weekend, I’ve decided to make one for her instead. I’m comforted by the fact that at home it’s usually made with store-bought puff pastry, so all I need to make is the almond butter filling. The picture above is from the Epicurious site, which has a recipe for a homemade pastry. I can not work up the courage to attempt that within the next two days, but I will go out of my way to get a quality, all-butter pastry for my cake. I’ll need all the help I can get for it to live up to the one in my memory.